The first thing you notice when you talk to Kapil Seshasayee is how excited he is about his work. FaceTiming him feels like a conversation between friends, and I find myself jotting constant notes about history I should research, artists I should listen to and movies I should watch. When he talks about his music he’s wide eyed and alert, oftentimes shaking his head excitedly with a sort of giddiness that makes you believe whatever he’s talking about is the coolest thing in the history of music. Luckily, his music is not only “cool” but also incredibly important. His forthcoming album is a concept work, focused around the Indian Caste system as something that, though no longer written into law, still has a profoundly harmful affect on the daily lives of many South Asian people. 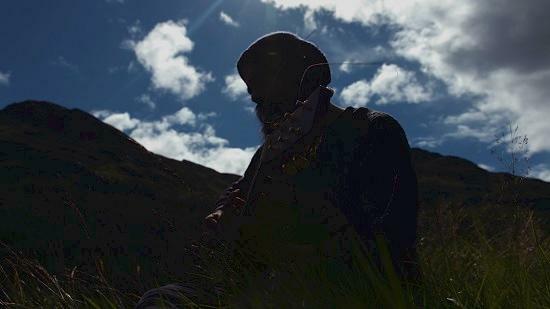 Being based out of Glasgow, Seshasayee is very conscious and critical of the fact that his music has a “steeped western influence” and actively educates himself beyond the white and western artists he’s grown up with. He completely geeks out when asked about his favorite band Steely Dan, but still acknowledges that they are the “whitest band of all time”. His research is thorough, as evidenced by his ability to tangentially recite a mini-biography of Mexican composer Conlan Nancarrow or gay African American composer Julius Eastman. And, when he tells you about how Nancarrow could make music humans physically couldn’t play, or how Eastman withstood exotification and criticism, I even find myself wanting to go down my own research rabbit hole. 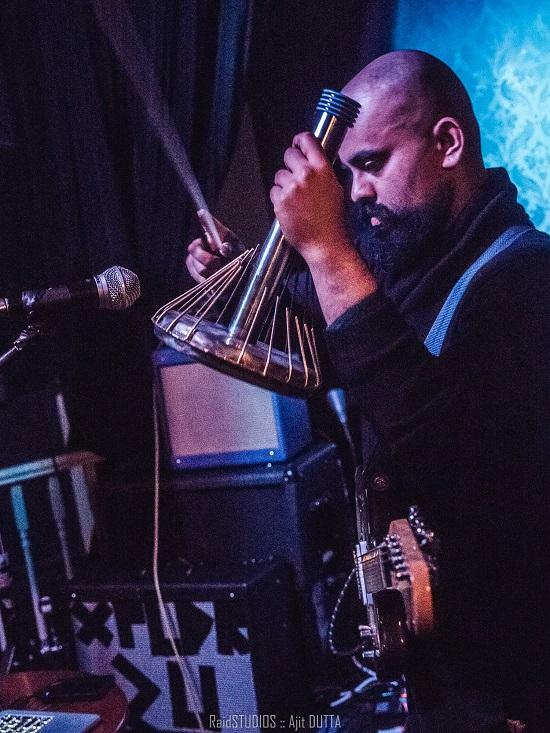 However, Kapil Seshasayee’s most intriguing attribute is perhaps his use of the waterphone, a cage-like instrument that one bows or strikes to make the unusual sound often heard after the jump scare in a horror movie. Though he uses his laptop to do some of the “heavy lifting”, Seshasayee’s live performance is hypnotic, showcasing his visceral use of the instrument and intense focus that attracted tons of attention at this year’s WRONG Festival in Liverpool. Combining unorthodox instrumentation with intricately produced computer music, Seshasayee creates sounds that lie somewhere between math rock, drum-machine driven punk, and experimental pop. His newest single and title track for his forthcoming album, ‘A Sacred Bore’, which is premiering exclusively with tQ below, showcases an unconventionally tuned guitar made to sound like an Indian Sitar, which it's hard not to see as an uncanny metaphor for Seshasayee’s uncommon mix of influences. Upon his signing to Liverpool-based label Loner Noise, tQ spoke with Kapil about the motivations behind his first concept album. The new album thematically covers the Indian Caste system – is there a specific incident that inspired you to talk about it or has it been on your mind to write about for a while? I’m 28 now and I’ve reached the age where a lot of people I’m related to and extended friends are thinking about getting married and I realised that many of my relatives and friends in India’s choices have been really narrowed down not by who they wanted to date but who they were allowed to date. The more I dug up the more I realised it wasn’t about whether someone’s a good person, is into the same things as you, or has the same family values as you but if they are in the same class as you. In terms of specific incidents, I had a job years ago where I worked in a call centre and there was a confrontation I saw between two Indian women. One of them was in her late 50s and the other one was 19-20. The woman in her 50s made the younger woman cry and storm out and quit the call centre. I bumped into her in a bar or something months and months later and she told me that the older woman had subjected her to loads of bullying based on caste. The irony of this is that the Indian Caste system has followed these people all the way to Glasgow, which is nowhere near India. Then I started watching documentaries and reading books about the caste system. There was a specific documentary called India Untouched from 2007 and everything that I watched was still relevant today. The story that stuck out to me the most was about people who have been walking in horrible high degree heat for miles and miles and if they come to a well and there’s somebody of a higher caste at the well they’re not allowed to use it. There was a woman with a crying child who said “I can’t use that well and I can’t feed my daughter now because someone of a higher caste is there and they get a priority”. I certainly didn’t know it was happening to the extent that it did and I needed to raise some awareness about it I suppose. Why do you think people are so unaware? It’s a mix of things. Because so much discrimination between people of a minority group and white people or people of an industry and people of another industry being really big in the west, and because quite often in the caste system it’s between minorities and other minorities, it’s easy to kind of hide it. It’s a strange mix because people in these communities don’t like to tell anybody outside of the community that it’s happening because it’s truly embarrassing to admit that your society hasn’t progressed past this system that’s hundreds and hundreds of years old. But simultaneously it’s a mix of people who are above calling the shots and making sure that nobody finds out about all the horrible things they do and people at the bottom being too scared to speak out about it. A large part of the album that is about the barbaric practices that I saw in that documentary still applies to the UK. These practices happen in England and they happen in the US, maybe not to the exact extent that happens in the villages, but there’s a lot of inequality going on beyond this class system that’s been misclassifying people for hundreds and hundreds of years. What is the ‘Sacred Bore’? I like the idea that it’s ‘Sacred’ in that it’s a tradition, but simultaneously it’s almost like “why is it a tradition?” I want to use the word ‘bore’ because the connotation is that something’s been drawn out and lasted its course but we’re still doing it. And I like the juxtaposition of something that’s boring as something that’s tedious, with something that’s sacred as something that you can’t touch and is very special. The idea of pushing these two words together is so that it represents the cognitive dissonance I see within south asian communities. We all acknowledge the flaws within the caste system but they chose to uphold it. They keep living by its rules despite how awful a lot of it is and the effect it can have on people and their children and their children’s children. Do you think the main pressure to keep it going is only because of that tradition or are there other motivations? Is it just that people don’t know where to begin? It’s a mix of that and, for example, if people live in villages and it has 20 people in it and somebody commits a crime or someone does something that’s a bit taboo, everybody’s going to know about it before long. The problem with communities of South Asians in the UK and the US is that because there’s so few of them they all tend to know each other and, ironically, you could have a few hundred South Asian people spread over a larger area who all talk about each other because of how small and tight knit the communities are. The problem is that that dynamic starts to reflect what it’s like to live in a village in India where the people are geographically only 20 people in one area. I think there’s a general fear of a lack of acceptance if you grew up South Asian in a predominantly white community, and I know this as a person who grew up in a part of Scotland that has no brown people in it. How are you incorporating these sentiments sonically into the album? Obviously it’s referencing caste lyrically, but I’ve also been researching into what kind of art the different castes create and sonically referencing that in the way the songs play out. So there will be things that are sampled, there’ll be phrasing, there’ll be intervals, and there’ll be chord sequences. Different songs on the record are about different castes, and I’m going to try to sonically reference what I’ve learned about the cultural artistic heritage of each caste within each song so that as you’re hearing each song they widely differ sonically and the wide difference you’re hearing is referencing the artistic heritage of different castes. I’m kind of creating a sonic catalogue of how the different castes compose things and trying to integrate the compositional heritage of each caste into each song from a different caste on the album.